Quite a read! 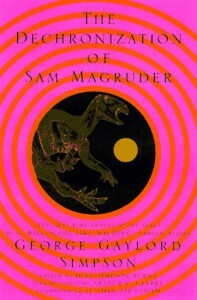 Not so notable for its 1960s-era dinosaurs, or its clunky science fiction with jabs at academic culture, and unevenly paced, but somehow fascinating.... the heart and soul of it is (as the the first chapter insists) the emotional situation of Sam McGruder stranded in the past with no chance to ever see another human again; how does he think in these lonely circumstances and what keeps him struggling to stay alive? The afterwords pointed out the emotional resonance with Simpson's own feelings of isolation and concerns that his life and work would be forgotten. But also a chance for him to lay out thoughts about the meaning of evolution, human destiny, and what is the ultimate dignity of life -- it's strongly reminiscent of Camus's Myth of Sisyphus. Although I'll keep the latter on my bookshelf and not this minor novel, it's still moving and well worth at least one read.